How to recognize a textile item which is truly produced in France? “Made in France”: means that a significant transformation was undergone in France. For example: the blanket can be made by making-up in France some fabrics which are imported. “Textile de France”: is a certificate created by the French textile federation, which guarantees that the blanket was fully made in France: spinning, weaving, dyeing and finishing. The only guarantee that the item comes predominantly from a true French industry is the “Textile de France” certificate. BRUN DE VIAN-TIRAN blankets bear this certificate: the factory spins, weaves, dyes, and finishes its blankets in France, in l’Isle sur la Sorgue. Why choose a French-manufactured item? The certificate “Textile de France” means that all the transformation steps are realized in France. It is a guarantee of control of all the production processes. BRUN DE VIAN-TIRAN blankets come from a completely integrated production from the raw material to the finishing. Is a quality blanket necessarily expensive? A good quality blanket may be used over several decades. It therefore costs often less than a poor quality item which would be rapidly overused. We spend one third of our lifetime sleeping, so the woollen blanket is an investment as important as the choice of a mattress. The choice of a woollen blanket is important since it brings you a refreshing sleep and comfort thanks to wool’s properties. Can one give a woollen blanket to a baby who has eczema? That is why, a healthy environment during baby’s sleep is preferable. Synthetic fibres avoid cold feeling but they can’t regulate humidity. There is a risk of sweat for the baby, which increases eczema. How to prevent a baby from sweating? Choose natural fibres such as wool (for winter), vegetal fibres as cotton, linen (for summer). These fibres are known since they absorb humidity and allow air circulation. What does a baby need to sleep well? - Bedroom temperature must not exceed 19 to 20°C. - Bedding should be made with natural fibres which combine at the same time physiological and thermal comfort: they isolate from cold without a stifling feeling. How to choose a mattress-pad? For a perfect comfort, a woollen mattress-pad is very adapted. During the sleep, “the body sweats 30g per hour, each night. The sweat is imprisoned between the blanket and the mattress. If the blanket or the mattress does not absorb humidity, you feel warm and wet”. Wool can “absorb humidity of its environment without humidity feeling. Like this, wool can warm up the air or refresh it, allows it to move and attracts humidity and body warmth”. - Summer: cool feeling, the air moves into the woolen sheet without stifly feeling. Physiological comfort: Wool creates a healthy environment for the sleeper, which limits dust-mite development and stops rheumatism evolution. I replaced my woollen mattress by a syntetic one. What is the difference? When you replace your woolen mattress by a synthetic one, you loose wool’s comfort properties. To find more comfort in bed, you can use a woollen mattress-pad. You can put it between the mattress and the sheet, it allows a soft contact and brings back comfort. So you benefit from wool properties and you sleep in a healthy environment. The legend of the hard mattress: Right or Wrong? For the comfort of the back, a hard mattress is advised, however, the contact between the spine and a too hard mattress can generate pain. Most famous mattress brands offer firm items which are soft on the surface. The mattress-pad is a solution to this problem. You can put it between the mattress and the sheet, it allows a soft contact. BRUN DE VIAN-TIRAN offers woolen mattress-pad, with several layers, machine-washable, for a perfect comfort in every season. How to take care of my woollen mattress-pad? 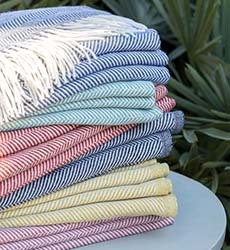 Like woollen quilts or blankets the better care is dry wash, which destroys dust-mites. Are you looking for a special and rare item? Yangir, Kid Mohair, Baby Llama, Cashgora, Turkmen Camel, Alpaca Suri, “Three Merinos”. 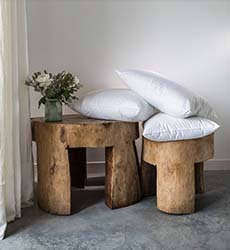 “Repeating the effect that Louis Brun had in the world of blankets in France, this collection is the outcome of research into rare fibres back from the most remote regions of the globe. Those fibres, outstanding products of Nature, are carefully manufactured to surround you with well-being and elegance ”. Why a summer blanket or quilt? During summer evenings, the weather is too warm to use a blanket. However, in the morning, the temperature is cooler, but the sheets are not sufficient and a blanket or a quilt would be too much. A summer blanket or a quilt answers this problem. They are lighter, less isolating in order not to increase temperature. -Dry summer: body perspiration and breathing generate steam. Wool is the best to absorb and eliminate humidity. “Delphes” and “Plein Air 250” for quilts. - For humid summer: Cotton, linen are the best designed to absorb sweat. I sweat a lot during my sleep, what should I do? Choose natural fibres such as wool or silk, or vegetal fibres as cotton and linen. Do I need a different blanket for each season? We adapt our clothes to each season, that’s why we have to do the same with our blanket. As we spend one third of our lifetime sleeping, a blanket is considered as a “garment”. BRUN DE VIAN-TIRAN created blankets for each season in order to obtain more comfort for a refreshing sleep. Why is wool the best fibre in the world? Wool comes from Nature; it is the result of natural selection. Animals which provide wool and hair: sheep, goats (cashmere, mohair,…), yak, camel, alpaca…need a fleece which protects them from coldness and allows them to sweat without being wet. Millions of years of natural selection have allowed Nature to create wool: the best fibre of the world to regulate humidity. We spend one third of our lifetime sleeping, why shouldn’t we enjoy this well-being? How to take care of a woollen blanket or a quilt? The best care for a woollen blanket or quilt is dry cleaning, which at the same time destroys dust-mites. Woollen blankets or quilts are easy to take care of in normal conditions of use. One cleaning a year is enough for a perfect hygiene. Blanket or quilt: wool or synthetic, which difference? Wool brings naturally well-being and health: its mission is to retain body warmth and eliminate humidity excess at the same time. - You sweat less: it absorbs humidity excess, which avoids a stifling feeling, the air moves around and you feel at ease. - You have a better sleep: eliminating humidity excess allows a peaceful sleep and avoids the feeling of warmth or coldness. - You avoid dust-mite proliferation: absorbing humidity excess reduces their development. - Wool does not attract dust and is self-repellent. As it contains water, it doesn’t create static electricity. - You limit rheumatism: the humidity rate being low, wool limits their evolution. Scientific tests have proved that wool is superior to all other commonly-used materials in its ability to eliminate excessive humidity. Wool is definitely the most appropriate material for a bed covering. Does wool favor dust-mites growth? To grow, dust-mites need temperatures between 25°C and 28° C and a high humidity such as the one generated during the sleep. Synthetic fibres, which don’t absorb humidity and don’t allow its evacuation, create a favorable environment for dust-mites development. On the contrary wool absorbs humidity excess and regulates it better than any other fibres. That is why it is more complicated for dust-mites to grow in a woollen blanket or quilt. Could one be allergic to wool? There is no documented case of genuine wool allergy even among exposed populations such as workers in the wool industry or shepherds. Popular opinion, false and which does not rely on any scientific evidences, pretends that wool provokes/causes respiratory allergies. On the contrary, regarding your comfort you have to use woollen bedding since, thanks to its properties, wool does not favor dust-mites and provides a unique comfort. Therefore, woollen blankets are proved to be the best to manage allergies. What conditions for a good night? We spend one third of our lifetime sleeping, the quality of our sleep acts on our behavior. That is why it is important to have a good comfort when sleeping. -keep a temperature in the bedroom from 19° to 20 °C and avoid heating up in order to respect a healthy microclimate. -choose a good bedding: choose natural fibres, for blanket or quilt, for instance wool or cotton, which absorb humidity excess. - add a woollen mattress-pad to soften the mattress and provide complete humidity control. Woollen mattress-pad: is the essential complement to a good bedding and a good blanket. Good advice to choose a woollen blanket or quilt? You sweat: choose fibres which absorb humidity, such as wool or cotton. You are looking for a thick item: choose a blanket or a quilt between 400g/m² to 750g/m². You are looking for lightness: choose a 400g/m² (or less) blanket or quilt. Why choose a woollen quilt? Wool combines, naturally, physiological comfort with thermal comfort since it is the fibre which has the best capacity to regulate humidity and keep warmth at the same time. - The microclimate remains healthy all night, without any excess of humidity. - It avoids a stifling feeling. - Your sleep is peaceful and refreshing. The woollen quilt offers the same qualities as the woollen blanket. In order not to spoil wool’s properties, BRUN DE VIAN-TIRAN quilts are made with porous envelopes which allow good air circulation: percale or jersey. Is a woollen quilt warmer? Wool has natural isolating properties. It provides warmth and allows good air circulation. It gives warmth without a feeling of stifling. BRUN DE VIAN-TIRAN quilts are adapted to every climate. - You feel cold and the temperature in your bedroom is cool: choose a winter quilt (350g/m² to 450g/m²). - You feel warm and the temperature in your bedroom is often high: choose a summer quilt: 200g/m² or 300g/m². - If you sweat during your sleep: in summer, choose a quilt filled with vegetal fibres, such as cotton or linen which have a perfect absorption capacity in humid environment.